Right after the conclusion of Alma’s meditation in Alma 29, the record indicates that in the 16th year there began to be “continual peace throughout all the land” (Alma 30:2), and then in the next year there was “continual peace” (v. 5) throughout most of the 17th year of the reign of judges (being the 50th year from King Benjamin’s speech). What a jubilee season it must have been, with the Ammonites now settled in the land of Jershon, and the sons of Mosiah safely and unexpectedly home after their 14 years of missionary work in the land of Nephi. The approach of the jubilee year marked an appropriate occasion for Alma’s pensive reflections in Alma 29. At the very point when the Nephites had recently, or would soon, sound the “trumpet of the jubilee” (Leviticus 25:8), Alma longed to “speak with the trump of God” (Alma 29:1). As a missionary, Alma wished to shout aloud the glories, goodness, justice and mercy of God. He longed to be able to shake the earth, as the angel’s voice had done when he stopped Alma and the four sons of Mosiah as they had gone about arguing against the church of God. Now Alma rejoiced in the deliverance of God and in the establishment of his covenant people. He wanted to invite all to repent and to join in the jubilee throng of the Lord. Although Alma’s desires were righteous ones, he nonetheless feared, “I am a man, and do sin in my wish.” As the high priest, Alma, it seems, would have been especially sensitive to the possibility that he sinned in his wishful thinking, because he knew of the particular importance that he, as high priest, not be tainted with even the slightest sin going into a Day of Atonement, especially at the commencement of the jubilee. Textually, it is remarkable, to say the least, that the Book of Mormon manifests literary motifs associated with the jubilee in two places exactly 49 years apart. The rapid dictation of the Book of Mormon18 would hardly have allowed time for Joseph to count off the years and to mark these jubilees with such subtle sophistication, let alone to set the gorgeous language in Alma 29 so richly in this contextual background. All of this gives evidence of Alma’s considerable awareness, experiential familiarity, and spiritual sensitivity. Outside of a Jewish-thinking community, few readers are particularly familiar with jubilee celebrations and the themes associated with them. For many profoundly motivated reasons, Alma’s soul-stirring words confer priestly blessings and express joyous love in ways that are fully appropriate to the jubilee occasion. Although most readers today won’t be participating in a jubilee celebration, all can find daily reasons to rejoice in God’s creation and recognize his hand in all things. Terrence L. Szink and John W. Welch, “King Benjamin’s Speech in the Context of Ancient Israelite Festivals,” in King Benjamin’s Speech: “That Ye May Learn Wisdom,” ed. John W. Welch and Stephen D. Ricks (Provo, UT: FARMS, 1998), 193–199. 1. Alma 28 closes out the 15th year (v. 7–10) and 16th year is already in progress in Alma 30:2–4, chronologically placing Alma 29 in the 16th year. 2. Mosiah reigned for 33 years (Mosiah 29:46). 33 plus the 16 years of the reign of the judges, makes 49 years since King Benjamin’s address. 3. Terrence L. Szink and John W. Welch, “King Benjamin’s Speech in the Context of Ancient Israelite Festivals,” in King Benjamin’s Speech: “That Ye May Learn Wisdom,” ed. John W. Welch and Stephen D. Ricks (Provo, UT: FARMS, 1998), 193–199. 4. Christopher J. H. Wright, “Jubilee, Year of,” in Anchor Bible Dictionary, ed. David Noel Freedman, 6 vols. (New Haven, CT: Yale University Press, 1992), 3:1025. 5. Szink and Welch, “King Benjamin’s Speech,” 195. 6. See Book of Mormon Central, “Why Did Alma Ask Church Members Fifty Probing Questions? (Alma 5:14–15),” KnoWhy 112 (June 1, 2016). 7. This was pointed out in Szink and Welch, “King Benjamin’s Speech,” 198. 9. As in Exodus 19:13; Joshua 6:6, 8 (used together with shofar). “Jubilee (yobel) is so called because its opening was announced by the sound of the trumpet (yobel).” Roland de Vaux, Ancient Israel (New York, NY: McGraw-Hill, 1965), 175–177. 11. There would seem to have been no reason why other types of horns, or perhaps even conch shells, could not have been used. Horns of antelope, ibex, oryx, and other goat species have also been used. See Jeremy Montagu, The Shofar: Its History and Use (New York, NY: Rowman and Littlefield, 2015), passim. Sirach 50:16, in the Apocrypha, even describes the use of “trumpets of hammered metal” (NRSV), illustrating that trumpets need not be made from the horns of an animal. Trumpets were also used in Mesoamerican rituals, where they were commonly made from the conch shell, though they were also sometimes “made of wood, clay, or gourd.” Anna Stacy, “Of the Same Stuff as Gods: Musical Instruments among the Classic Maya,” Colligate Journal of Anthropology 2 (May 2014), online at http://anthrojournal.com. Jogre Perez de Lara, The Cultures of Ancient Mexico: Photographs from the Natural Museum of Anthropology, images 115, 148, 150, 151, 152, 153, 154 show conch trumpets from Mexico dated to the Late Preclassic/Early Classic period. The Kimball Art Museum has a conch trumpet from the Central Lowland Maya area dated to AD 250–400, online at http://www.mesoweb.com/lords/power04.html. Conch trumpets can also be seen in Classic Maya vases, such as K3247 and K4336, online at http://research.mayavase.com/kerrmaya.html. Also see John L. Sorenson, Images of Ancient America: Visualizing Book of Mormon Life (Provo, UT: FARMS, 1998), 178–179. 12. 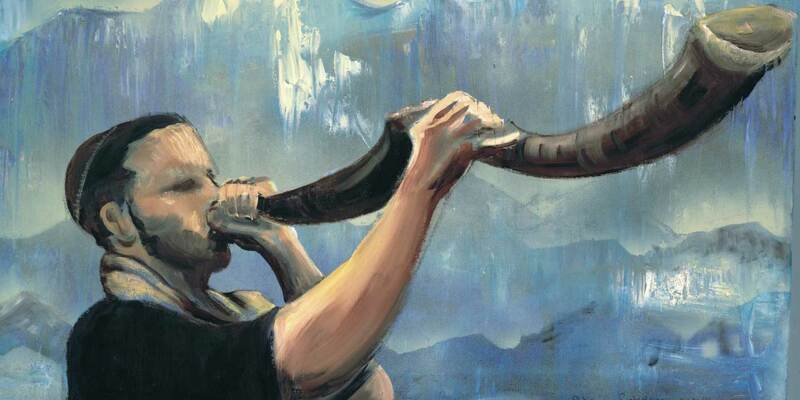 According to David J. Larsen, “Angels Among Us: The Use of Old Testament Passages as Inspiration for Temple Themes in the Dead Sea Scrolls,” Studies in the Bible and Antiquity 5 (2013): 101, “In the biblical texts, the teru’ah is a shout or a trumpet blast, usually given in the context of a temple ritual on a festival day, such as the Feast of Trumpets or the Day of Atonement.” David J. Larsen, “From Dust to Exalted Crown: Royal and Temple Themes Common to the Psalms and the Dead Sea Scrolls,” in Temple Insights: Proceedings of the Interpreter Matthew B. Brown Memorial Conference—“The Temple on Mount Zion,” 22 September 2012, ed. William J. Hamblin and David Rolph Seely (Salt Lake and Orem, UT: Eborn Books and Interpreter Foundation, 2014), 151 noted that yom teruah means “day of shouting/trumpet blasts.” This nuance may be reflected in Alma’s words, where he equates the “trump of God” with “a voice to shake the earth,” even “the voice of thunder” (Alma 29:1–2). 13. Szink and Welch, “King Benjamin’s Speech,” 198–199. 14. See Alma 29:9, 10, 13, 14 (2x), 16. In Alma 29, one can also identify 28 doublets or word pairs; 5 word triplets; and 7 word quadruplets. No other word in this text appears more than six times, except for the words Lord and God; and the word know appears 5 times, and knoweth 2 times. 15. See Corbin Volluz, “A Study in Seven: Numerology in the Book of Mormon,” BYU Studies Quarterly 53 no. 2 (2014): 57–83. 16. For themes of the jubilee year, see John W. Welch and J. Gregory Welch, “Benjamin’s Themes Related to Sabbatical and Jubilee Years,” in Charting the Book of Mormon: Visual Aids for Personal Study and Teaching (Provo, UT: FARMS, 1999), chart 91. 17. For more on the sin in Alma’s wish, see Book of Mormon Central “Why Was Alma’s Wish Sinful? (Alma 20:3).” KnoWhy 137. 18. For the timeline of translation, see John W. Welch, “The Miraculous Translation of the Book of Mormon,” in Opening the Heavens: Accounts of Divine Manifestations, 1820–1844, ed. John W. Welch (Provo, UT: BYU Studies, 2005), 77–117.